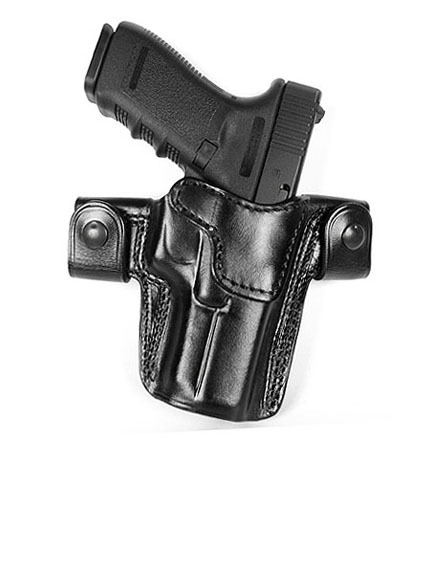 The Ritchie Leather P365 CQQR Holster is a right handed outside the waistband holster designed to be easily strapped onto your gun belt for quick and easy removal. Wet molded and hand boned for your specific carry weapon. Will fit railed or non-railed models Right Hand. Fantastic holster for my new carry gun, Sig Sauer P365. As always, fast shipping. Great Holster. Keeps gun very close to my body and was easy to break in. The design is such as it wraps around your body. Best part is easy on and off. Many times I elected to pocket or IWB carry for short trips to the store and back. Now I can easily slip this on and with the Sig P365 you cannot see the gun even under a light tee shirt. I hate IWB carry. Hurts my hip and is uncomfortable. Now I OWB carry all the time. Great construction and leather. This is my second Richie holster. The other carries my Commander sized 1911 IWB but due to bad hip, have not done much IWB unless it is going to be a quick trip.